Seanie Johnston's eight points proved the difference as Cavan eased to victory over a wasteful Antrim in Sunday's Ulster SFC opener at Casement. Cavan led 0-3 to 0-0 and while CJ McGourty's goal got Antrim on terms, Dermot McCabe's strike helped Cavan edge 1-9 to 1-7 ahead at the break. 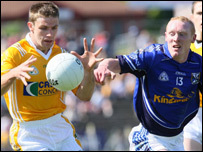 Antrim cut Cavan's lead to a point on two occasions but never got on terms. Cavan then took control in the closing stages to consign the naive Saffrons to the Tommy Murphy Cup. 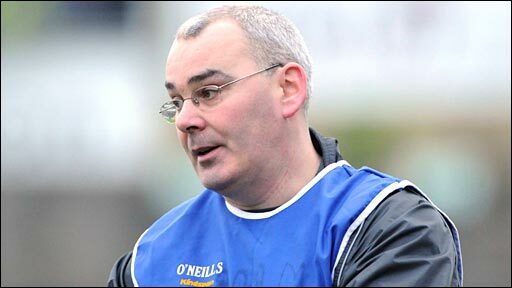 The Breffni County's victory means they will play Armagh in the Ulster first round on 15 June. Antrim hit 15 wides but many of the attempts were speculative and Cavan were much more effective in forging genuine scoring opportunities. 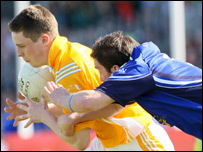 The slow delivery of possession into the Antrim attack was in contrast to the direct and purposeful approach of the Breffnimen. Cian Mackey pulled the strings for Cavan in the first half with Johnston finding his form after being shackled by James Loughrey early on. The introduction of Lorcan Mulvey then bolstered the Cavan midfield in the second half while Paul Brady's arrival also helped the Breffnimen take control. A minute's silence for Robert Dunlop and Cavan GAA stalwart Veronica Sharkey was impeccably observed before the throw-in and the Breffnimen were quickly into their stride as they knocked over the opening three scores. However, out of nothing the Saffrons were level with CJ McGourty firing low to the net after Paddy Cunningham's clever lay off. But Cavan quickly restored a two-point advantage and they would have been even further ahead but for Sean McGreevy's heroics in the 18th minute when he turned a Jason O'Reilly piledriver over the bar. Two excellent Johnston scores helped Cavan lead 0-9 to 1-2 after 25 minutes but Antrim responded with four points in as many minutes with Cunningham, Thomas McCann, Ciaran Close and McGourty all on target. However, the Saffrons then suffered a massive blow two minutes before the break when McCabe hammered in a goal from close range after he had fielded a high ball on the edge of the square. Trialing 1-7 to 1-9 at the break, Antrim wasted a glorious chance to cut into Cavan's lead when Tony Scullion blazed wide after charging into Breffni County territory. A McGourty point did cut Cavan's lead to the minimum but Martin Reilly immediately restored Cavan's two-point advantage. A Kevin Niblock score reduced Cavan's margin to a point again in the 50th minute but Cavan then upped the pace with four unanswered scores to effectively kill off the Saffrons. By that stage, Johnston was on fire in the Cavan attack although Mulvey and Brady were doing tremendous work out the field for the Breffnimen. Johnston's eighth point increased Cavan's lead to 1-18 to 1-12 and while Antrim hit two of the last three scores, a comeback was never on. Antrim: S McGreevy, K O'Boyle, A McClean, J Loughrey, T Scullion, J Crozier, S Kelly, A Gallagher, M McCann (0-1), P Close, K Niblock (0-1), T McCann (0-1), P Cunningham (0-4), CJ McGourty (1-4), C Close (0-1). Subs: M Magill (0-2) for P Close, T O'Neill for C Close, C Brady for Crozier, T Convery for Gallagher, E O'Neill for Niblock.